Is your strong-willed teen confusing you? Looking for that magical thing that will make everything all better? I don't have the answers, but I think I'm doing pretty well with mine... (well, for TODAY anyway...) I think about this so often, how to raise my child. Figuring out the best way to parent this child has been a full time job for me, trying to help her to grow up to live a healthier and a happier life. It's not easy and both of us struggle with it...because it matters to us. Actually I'm so grateful that my daughter is strong-willed. I myself was a mousy teen. Wishy-washy is how I thought of myself. So while I was pregnant with my daughter, I frequently heard myself saying that I wanted a strong-willed child, a child just like my sister Brenda, I would say. Well...I got one! So, to me the term "strong-willed" is not a pejorative; It is a challenge! Of course, there are no magic bullets in the parenting game, but I have figured out a few things in how to parent this child who is strong-willed. The way our parents raised us, that last generation, would not bring this child up to be healthy or happy. That authoritative parenting that I grew up with would, I think, make my child into either a bullying tyrant or an extremely insecure mouse who doubts herself. I didn't want my daughter to be either one of these... though she skims over both of them at times. A parent's dream, to avoid the negative stereotypes with their beloved children. I've learned a few lessons as I've traveled this path with my daughter. For example, a token economy-type arrangement does not work with the strong-willed child. John, on the other hand, is thrilled to "earn" good points. Elizabeth couldn't care less! She laughs at the idea. She is not so lame that I can buy her cooperation. Oh no. Not this kid. 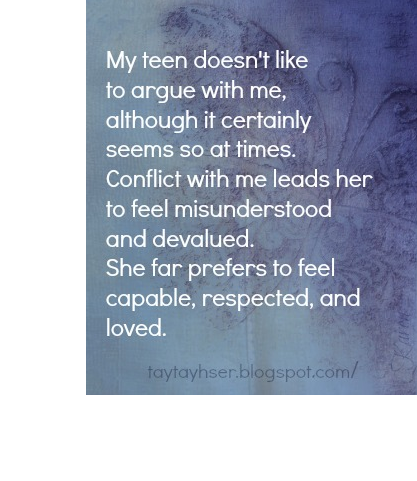 I have also learned that my beloved teen doesn't like to argue with me, although it certainly seems so at times. Conflict with me leads her to feel misunderstood and devalued. She far prefers to feel capable, respected, and loved. In fact, I think being heard and being understood are the major goals of Elizabeth's life right now. If she could accomplish these things without the drama, I'm sure she would do it. Another lesson I have learned is that those teen years don't necessarily have to be about teens "growing away" as they grow up. You can continue to experience delight and joy with your teen as long as your relationship with your teen stays strong (or gets repaired.) Although our culture tends to disrespect a close parent/teen bond, even to expect significant distance between parents and teens, each family has it in their power to create a family of their own definition. Allow your teens to direct their own lives, learning, healthy activities, and passions just as much while they are teens as you did when they were little ones. Celebrate with them. Be sensitive to their feelings. Acknowledge their struggles. Enter into difficult but honest conversations. Learn new ways of dealing with their growing and questioning minds. Support their journey. It means evolving as a parent. As Elizabeth has grown up, I have worked hard to figure out the best ways to parent her. I have these few hard-won truths that underlie my philosophical approach to being the best parent I can be for her. I have a few truths that I have had as a starting point when feeling like I am in a muddle, which happens often these days. Say "Yes" - Unless a thing is unhealthy, unsafe, or unethical, I want to be able to tell my children "yes" as much as possible. Why? Because I want my kids to know that they can make choices and to live with those choices. In general, I stand behind this though I have regretted it on occasion. Expect her to treat others kindly - Under no circumstances is it okay to victimize another person or to make them subservient. Avoid punishment and grounding - In almost every case, this type of parenting merely sets up a negative feedback loop. 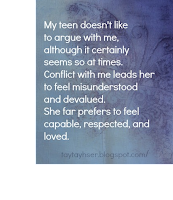 The teen feels misunderstood and sits and stews in those feelings; that is the last thing she needs at a time like that. Talking a crisis through is a better way of encouraging a teen to work through the overwhelming emotions. Almost no teen ever went into a grounding without also slamming a door. At least mine never has! Be honest - As long as my children are honest with me about mistakes, I always give some leeway in consequences. And my honesty with them lets them know I trust and respect them. Always model mature behavior - Regardless of how pissed off I am, I seldom go off on my daughter. I have raised my voice, but I know that she uses my increased volume as a sign to increase her own. If I need a time out, I take one. Involving my daughter in decisions about her life does not take away my authority, but it shows her that I respect her opinions and her needs and that I think she has a great deal to offer. View "defiance" as a problem with the relationship in that moment - rather than as an issue with someone's personality. At this point think about how to improve the relationship. Just stop, take a breath, and remind yourself that winning a battle with your teen always sets you up to lose what’s most important: the relationship. Not surprisingly, my daughter is always aware of this transition in an interaction and she transitions as well. Recognize she is feeling out of control - At the moments of her worst outbursts and behavior, I know she is feeling either out of control, painted into a corner, or in a "down" position. At any one moment, she is doing the best she can so I have to be aware of these meta messages and make changes accordingly. Our relationship matters - I have this advantage, there is no doubt that our relationship means a great deal to both of us. Some parents may not have this advantage. My daughter is tough, it is true. But I know that, no matter how hard she makes things, as some point she will always come to me, apologize, and be able to talk and think again. Reinforce the desired behavior - Without fail, expecting a child to learn from negative consequences will not produce the desired behavior. We all know this. OK, LOTS of information here. Stick with me. 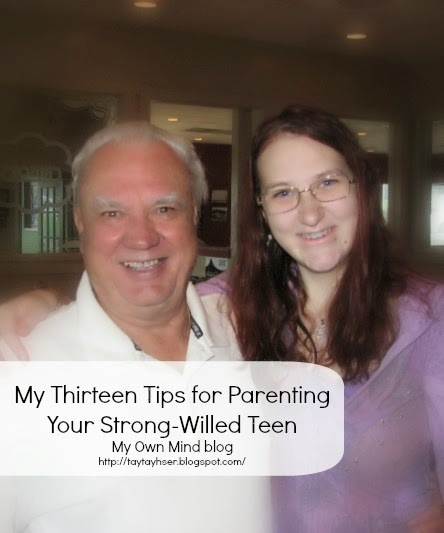 Without further ado, and after much thought, here are my thirteen tips for dealing with my strong-willed teen. I don't claim that they are miracles, but I do claim that these tips can improve even the most difficult of parent/teen relationships. Maybe even the most difficult human vs. human relationships. There is no point in needing to be right. Allowing my daughter to have her own views and to find her way to new information has very positive effects. It allows her to not have to be oppositional with me. It means that our conversations can be less about her being in a "learning" position, which she hates, and more about us exploring ideas together. If I give her the room to back down, she will do so gracefully (and gratefully). And, I notice that the times when I force the issue of me being right, the less productive it is. Letting her save face also allows her to feel positive about the lessons she does eventually learn. P.S. Needing to be "right" is a power struggle you don't want to get into and it suggests that you have become a part of the problem rather than a part of the solution. Besides, NO ONE learns a lesson during a conflict. The more you push the issue, the less likely your teen will ever "give in." Remember that thing about how we are our child's inner voice? The way I talk to my daughter will become how she talks to herself. If I am harsh with her, she will take that inside. If I am gentle, yet firm, she will learn to let herself off of the hook when she feels stuck inside, even when she needs limits and boundaries. Putting your relationship with your child in the forefront and sincerely letting them know that the relationship is important to you helps! I have found that our best days happen when we both acknowledge that our relationship is essential to our sense of well being. A strong-willed teen is seeking to master her surroundings. The more I allow her to make her own choices without my input, criticism, or comment the happier she feels. Of course this means that we all have to live with her choices. As long as she makes those choices, however ridiculous they may seem to me, the less she feels the need to rebel against me. For example, Elizabeth has these shorts that I think look like underwear with the Union Jack on them. She thinks that they are OK to wear in public while I think they look shocking. The other day, as I was driving her to the mall to meet with friends, it occurred to me that she might be hiding something about her wardrobe. I asked her if she was hiding some Union Jack under that long black skirt. She looked over at me and said that she was. I could have freaked. (Maybe I should have, but) I asked her to show me how they looked without the skirt. With the black tights they still looked awful, but I told her, "Well, then keep the skirt in your bag in case you want it." Off she went, at the mall, wearing the underwear shorts over the tights. When I picked her up later, she was wearing the skirt. BAM. I wasn't the bad guy. But watching her walk away in that get up was murder! The dressing issue comes up for us often, but there is more, more than just the shoulder-length earrings and black make up. One morning, picking her up from a sleepover, I found my daughter's skin covered with tons of doodling, all in Sharpie Marker. Words, images, all over her body. I could see her waiting for me to explode. I wasn't happy, but I did say, "How cool is that one...who gave you the Union Jack?" She was so happy and talked about the experience for days. Later she admitted how silly the ink was and how it lasted way longer than she had hoped. Also, when my sister was in high school she and her best friend shaved their heads, bald! We could have freaked. But, guess what, it grew back. Try to see struggles from her point of view. When Elizabeth sees that I am seeking to see her point of view, she appreciates that. For a moment, overlook her unpleasant attitude and look at the content of the situation. Evaluate the conflict based on whether it strengthens or weakens your relationship with your child. Making this effort to approach the conflict in this empathic way helps your teen focus on improving her behavior rather than on being angry at you. Remember what it's like to have a tyranical boss - Who likes this? Who enjoys and respects a tyrannical boss? No one, of course. Start all interactions by reaffirming the importance of your connection with your teen and remember that teens generally enter into conflict when they feel bad about themselves or when they feel disconnected from us. These states of mind can be difficult for a teen to put into words and they can be a difficult feedback loop to escape from. Use empathy when setting limits - Sometimes we, as parents, have to say "no". When necessary, do so with empathy. Acknowledge your teen's feelings so that they know that you truly care about the feelings that they have. 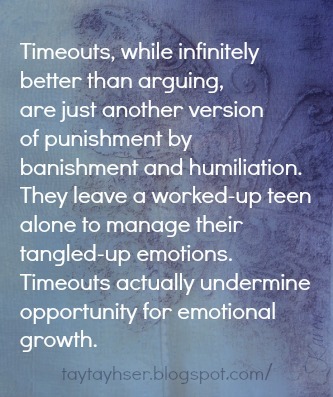 The less confrontational a limit is set, the easier it may be for your teen to accept those limits. In ALL situations when your child is in danger, you must set limits with extremely high levels of empathy and enforce those limits. Offer your strong-willed teen respect and empathy. Most teens are fighting for respect. If you offer it to them, they don’t need to fight to protect their position. And, like the rest of us, it helps a lot if they feel understood. If you see his point of view and think he's wrong you can still offer him empathy and meet him part way while you set the limit. 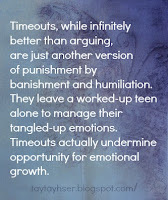 Avoid Groundings and Punishments -Timeouts, while infinitely better than arguing, are just another version of punishment by banishment and humiliation. They leave a worked-up teen alone to manage their tangled-up emotions. They actually undermine opportunity for emotional growth. They break down, rather than strengthen, your relationship with your child. They set up a power struggle. Instead, expect a teen to face natural consequences. Teens can learn alot by suffering through natural consequences. In some difficult cases, we all learn from letting things go wrong. Give yourself a timeout when you feel like your temper is rising. If you're in a heated discussion, excuse yourself for a few moments before shouting or saying hurtful things. Take a break until you can come back with a more rational approach. Your teen will see a health way to handle being difficult and may be more apt to play a calmer part in the discussion once he sees that you are being respectful toward him. Recognize that the final goal is for your teen to be able to self-discipline. It takes time and the teen years are learning years. Ultimately loving guidance results in your teen being better able to make decisions for herself...and isn't that what this is all about? Number 14: ENJOY and CELEBRATE this child! That strong will will take them far in life! Much of this is MY attitude needing adjusting. Thanks so much for sharing, and reminding me that I'll get better results if I can include my child in the decision making process, even when they're young. My daughter, who is six, is having a terrible time keeping her room clean, and while I understand it is her space, I can't walk in there without being bothered by the clutter. Maybe together we can come up with a way to deal with it. Thank you, Lana! I think YOU are awesome! I can totally relate to this, not as a mom (my son is just 5 years old) but as a former "strong-willed" teen myself. It would have made such a difference in my relationship with my mom if she'd have taken even some elements of your approach here. My daughter is only 7, but I see a lot of things here that I could put into practice. Especially number 4. Saving Face. I put her in a "learning" position so often and she does hate it. When I remember to explore ideas together it goes much better. So much to ponder here. Thank you for putting so much work into this post! My daughters are only 4 and 2, but I agree with Diana that had my mother adopted these principles and parented with respect more than control, our relationship would have been much better. The Doctor is a lucky young woman to have you for a mama! So many of these principles apply to interactions with my preschoolers as well & I'm printing and saving this blog post for 10 years down the road! p.s. 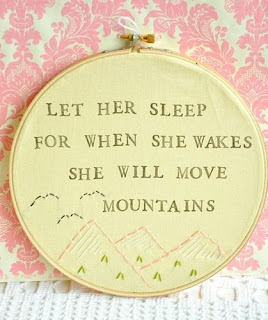 Any idea where to find the pattern for the lovely "she will move mountains" embroidery piece? thank you to Jen, Diana, and Lara. I would love to see more parents embrace personality traits of their children, rather than try to change them. That would include shyness, high activity levels, etc. There is a part of me that would find her MUCH easier to deal with if she were more compliant. Of course. But my brain and heart are always in there telling me, "Don't change her. Love her as she is!" I guess one of the main reasons for this that I want my children to have NO guilt/shame over the person that they are. That sort of "parenting" is RIDICULOUS! This is wonderful! I can attest from personal experience that you are absolutely right. I was a strong-willed teenager of controlling parents. Things did not go well (understatement) When I realized my intelligent yet stubborn daughter was another version of me, I promised myself I'd do things different. I've raised her just as you describe here, and it works! Other parents accuse me of being soft. Then they wonder why my daughter is such a great girl. Hello people, punishment just makes things work. Thank you Karen! I can't wait to share this! Remember to trust your own instincts. It has almost never gone well when someone's advice felt wrong to me and I tried it out. As a parent of a "strong willed" teen girl, 15, I will tell you that I agree with MOST of what you are saying, however, when the response back is disrespectful to her mother, this is where I draw the line. Sometimes there MUST be consequences for their disrespectful behavior, like a "grounding" where they can sit in their room and think of the results of their actions. As always, you have to decide what is important to you. Do you want your daughter to respect you and do you think that that respect will come through her time in her room? I don't think many kids ever came to parental respect through a good grounding, but I respect your efforts. It can be hard to figure this parenting thing out. :) What a great kid. My daughter, too, will tell me that she appreciates my efforts to much, and that she learns from what might be considered failure. In fact, she recently got herself a tattoo that reads "Fail Better". I am the mother of a strong willed 14 yr old daughter and am looking for some insight, my daughter was recently at a friends house and they stole the mothers whiskey and vodka and got some weed from a friend and preceded to have a little party. I found out the next morning and promptly stripped her of any freedom, and all electronic devices, she does not have a phone and we don't do social media for the children in our home but she was able to text friends. that was 2 weeks ago. Last night I went in to tell her good night and saw a phone peeking out from under the blankets, she took it from her brothers room and was trying to crack the password. I am not sure how to apply your strategies in my situation? Talking with no consequences does not feel right. Any suggestions? Geeez...yeah, add drugs and/or alcohol and you change the rules, don't you? We adults know exactly how devastating and destructive they can be, especially in kids of this age. Without knowing any other history or anything, if I may be presumptuous, I might make a few suggestions. What we are working on here, is improvement. Your daughter has so much going on in her head...any idea what it is? In the two weeks between her grounding and finding the stolen cell phone, what was going on? She was grounded, in her room, most likely stewing and angry and alone and feeling misunderstood...the last thing she needed at that point was to stew all alone. What does she need? I don’t know...“You time” might be a good start. Empathy, reminding her that your relationship means something to you, you hope it means something to her… That you are on her side. That you want to trust her. That the substance abuse concerns you...did she get the feeling from it that she was looking for? I might shock you here, but if my kid wanted to try it, I would have her try it at home, in a safe place, NOT in secret, openly. Kind of takes the forbidden part way. She’s 14. That is a very rebellious time. Give her LESS to rebel about. Allowing her to “use” with your knowledge might take the fun of sneaking away. Knowing and allowing it, even to the point of providing or supporting it has made real change in my daughter’s actions… I’m not recommending you do anything you can’t do. I’m a very different person from you. But my thought is that having some pot in my own backyard with me in the kitchen kind of takes the fun away while sneaking it with friends is quite a buzz. “Stripping” her of her rights and freedoms sounds very much the opposite of what this blog recommends, the opposite of my parenting philosophy. 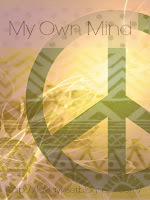 Knowing the minds of teenagers, setting yourself up as the other camp...well, it just puts you on opposite sides. Another, possibly shocking possibility, talk to her about what she thinks is the correct reaction would be to her behavior. Sneaking, lying, stealing, using. What would she recommend you do? Can you find a half– or mid-point compromise? I’m not SURE. I’m just offering these thoughts. What do you think, Anonymous? They get that their teen has a unique personality and temperament that needs to be respected, supported and nurtured, even if that means adjusting their own expectations of who they hoped this growing child would become.